Years ago, soon after my conversion to Islam, I attended my first and perhaps only MSA East Zone Conference in Rochester, NY. I had not yet integrated into the Muslim community and being amongst so many other Muslims was a revelation, comforting, and fun. While shopping in the bazaar, I purchased some lectures including Hamza Yusuf’s 16 CD translation and commentary of the ninth century Moroccan scholar Sidi Ahmed Zarruq’s penetrating work The Poor Man’s Book of Assistance. I’ve listened to the complete set at least 3-4 times, maybe more, and the CD case is beginning to show the wear and tear. 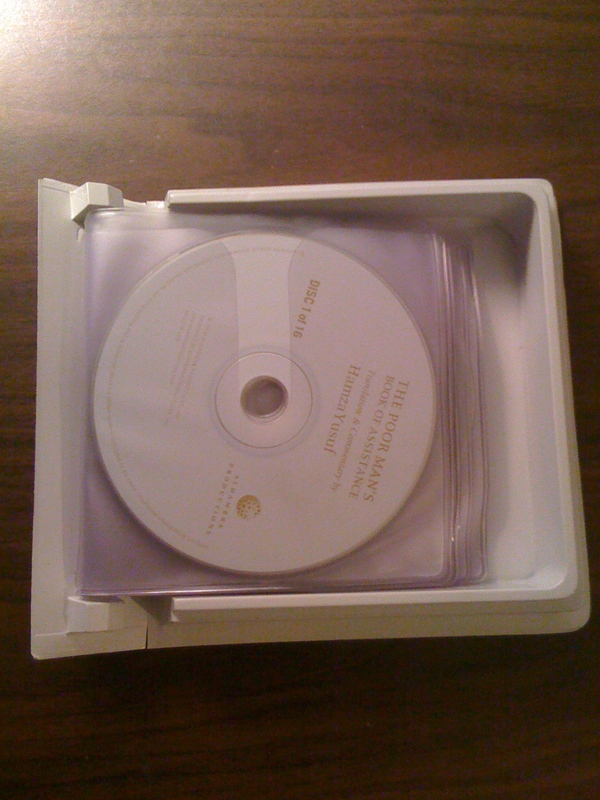 The top half of the CD case has completely separated from the rest of the case. A few weeks ago, I started re-listening to the CD set while commuting back and forth to work and school. Sidi Ahmed Zarruq’s keen insight into the reality of the human condition allowed him to tailor his book into practical advice and steps for anyone seeking nearness to God and to improve one’s own spiritual condition. I’ve resolved to listen to the set again, while not driving, so that I can take notes on it. Last year I purchased a used car, and on one of my first trips after the sale, I went to a fundraising dinner for a local Muslim newspaper. 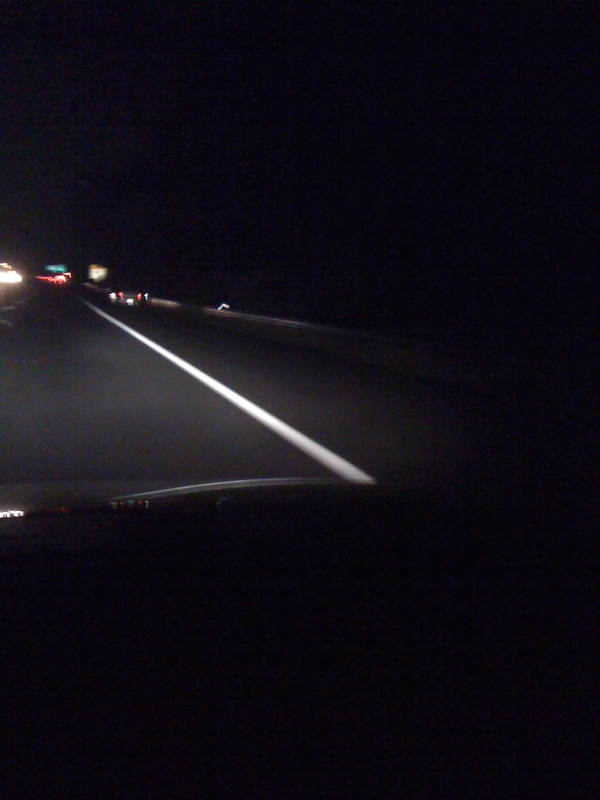 That night, while driving home on the highway, my car began to lose power. I was just barely able to cruise towards and reach my exit. And as I reached the end of the exit ramp, my car died at a red light. Thankfully, a lot of other Muslims live in the area and were also on their way home from the dinner so there was no shortage of offers of help and assistance. It was a little embarrassing but the warm expressions of support were deeply appreciated. We tried to jumpstart my car but it wouldn’t start. Turned out to be a problem with the alternator. 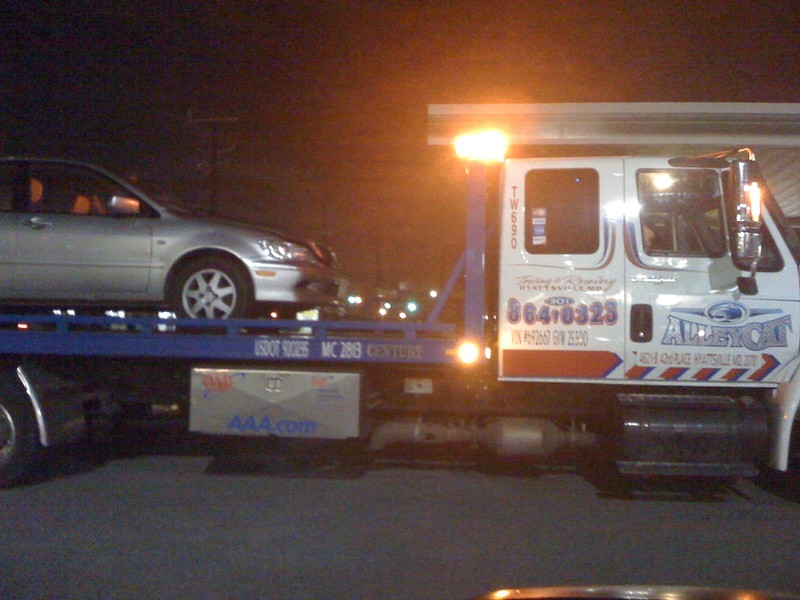 My car being towed after the Muslim Link dinner. A couple of police cars showed up because my car and the cars of the Muslims who stopped to help me were blocking the left turn lane of the exit ramp. The police wanted us to move the cars but of course my car wouldn’t budge. And just then, a tow truck driver on his way to a different job pulled up in the lane beside me and asked if I needed a tow. I said, “Yes,” and within a few minutes, he hooked up my car and towed it to a gas station near my home. Everything worked out perfectly, I was humbled and thankful for what I saw as providential care and for the social support of my local Muslim community. Throughout, the situation I felt a sense of calm and inner peace, which I attribute to being focused on the larger picture of this life. When we get angry or argumentative or bogged down in the stressors of life, we’ve lost sight of the bigger picture. Life’s too precious and too short to waste on matters that bring no benefit. The only real and lasting joys are in knowing God and in the higher purpose of life to worship him through our actions. Everything else is so fleeting and won’t benefit us in the hereafter. And besides, if you believe in the divine decree, then you know that’s what God has written for you. Recently, my car has needed quite a bit of work. I had to fix the heater, the left turn signal and tag lights had an electrical wiring issue, changed the brake pads and rotor, and got an oil change. The tread on my left front tire is worryingly worn and needs to be replaced, and I’ve been working with the mechanic who sold me the car to repair my air conditioner. Tonight, on my way to work, I experienced a bit of déjà vu, as my car once again began to lose power on the highway and eventually ground to a halt. Mercifully, this time, on the shoulder of the highway. Not sure why, will have the car towed in the morning, insha’Allah. But as I waited for a friend to arrive to pick me up, I finished listening to the last of the sixteen CDs in The Poor Man’s Book of Assistance set. Once again, I felt an inner sense of calm and peace and was thankful reflecting on the many blessings in my life. Among the greatest gifts I’ve received in my life is the gift of Islam and with that an understanding of who Allah is and who the Messenger of Allah is and of the book and guidance found within this religion. Without that, I’d be lost and something small like my car stopping on the road would throw me for a loop. We’re not perfect, we make mistakes, and this life is a journey through constant taubah (repentance) and istiqama (firm uprightness). My father is a professor of African and African American history and I can vaguely remember seeing on his bookshelves at home a book authored by Sulayman Nyang in my childhood. Many years later, when I was in the process of thinking about Islam, long before, well, at least a few months, before I converted, I ordered a large number of books about Islam online. 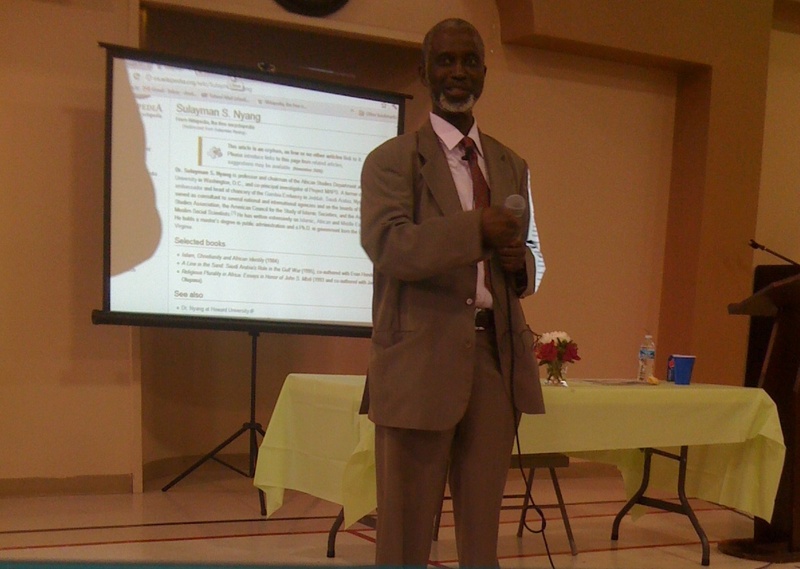 And one of the books I purchased was Dr. Sulayman Nyang’s Islam in the United States. These books formed my first in-depth introduction to and study of Islam, which eventually culminated in my conversion. So I was quite interested to have the opportunity to attend a day-long lecture on the history of Muslims in America given by Dr. Sulayman Nyang, the head of the African Studies department at Howard University. He reminded us that even though popular American history often begins with the arrival of Columbus that the history of Islam in America began during the Pre-Colombian period and that events that transpired at the same time in Africa and Europe are also a part of this story. Nyang emphasized that Muslims should learn this history and not see the history of Europe or sub-saharan Africa as separate from our story as American Muslims but to integrate it into our understanding. According to Dr. Nyang, the most conservative estimates indicate that up to ten percent of the Africans brought to the Americas as slaves were Muslim. More than the trans-Atlantic slave trade, the story of Muslims and America includes the war-like encounters with the Barbary pirates in North Africa. Interesting that more than two hundred years later, the U.S. is once again engaged in armed conflict in Tripoli. Around the turn of the 20th century former U.S. President Theodore Roosevelt as the police chief in New York City was dubbed Harun al-Roosevelt after the Muslim caliph Harun al-Rashid. Both are said have wandered the streets at night to gain a better perspective on the everyday lives and happenings of the people whom they served. Many Yemenis were employed in the automobile industry in and around Michigan, which is now one of the largest centers of Arab Americans and Muslims. These early Arab immigrants tended to marry white or black women if they did not return home to marry an Arab woman. Muslims from Southern Europe and of Slavic descent tended to settle in northern cities and in the Midwest. Some Muslims arrived from South Asia and the Asian Pacific islands like Indonesia, Malaysia, and the Philippines and settled in the Western part of the United States and Canada. Among the Muslims settling on the West Coast were a large number of Muslims and Sikhs from the Punjab. Some of these young Punjabi men worked in the rice fields in California and married Mexican immigrant women, which led to the formation of the Punjabi-Mexican ethnic group, and some of their descendants can still be found today. Important to the story of Islam in America particularly among Muslim immigrants was the construction the Suez Canal, which allowed more direct travel between Western countries and Asia, the Cold War, and the influx of young Muslim students in the latter half of the 20th century. Prior to Cold War, ninety percent of Arab immigrants in America were Christian. Today, the numbers of Arab Christians and Muslims have almost equalized. As the Cold War progressed, more and more Muslims began to immigrate to the United States and would begin to lay the foundation for the creation of the influential Muslim Student Association and the Islamic Society of North America (ISNA). The MSA began on college campuses and propagated a conservative form of Islam, which sought to correct what they believed were misguided or deviant interpretations. More well-known is the story of African American journeys and encounters with Islam. 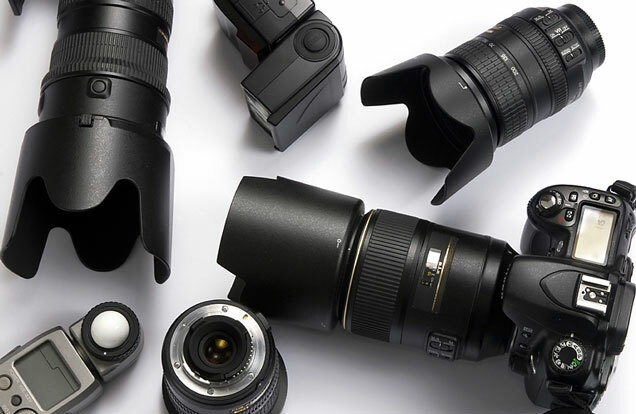 However, there are two distinct narratives of Islam in the African American experience, which include a more traditional form of Islam and the formation of proto-Islamic groups. The story of traditional Islam is often mentioned in reference to Muslim immigrants or about Americans who traveled overseas to Muslim lands like Alexander Russell Webb and the remnants of Islam maintained by the descendants of African slaves as in the example of the Gullah people of the coast of South Carolina. A number of the proto-Islamic groups like the Nation of Islam or the Moorish Science Temple held beliefs deemed heretical to many of the more traditional Muslims. Among the important legacies of the African American Muslim experience is that of institution building from mosques to schools to businesses, both on a local and national level and of interfaith work and dialogue. A legacy, which other American Muslims have only recently begun to recognize and emulate. One stumbling block in the development and maturation of Muslim communities and institutions was the “Myth of Return.” Many Muslims immigrated to America believing that they would earn their education and living here and someday return to their home country. For these Muslims, their identity and roots were firmly moored in old world realities. But their children, often born here in America, do not share that same nostalgia for their parents’ home country and may not even be able to speak the language. 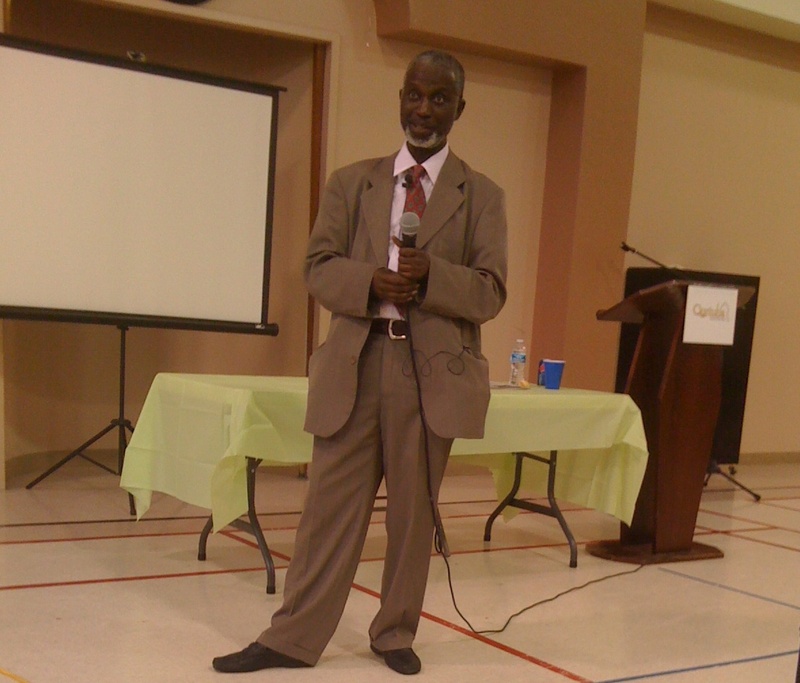 According to Dr. Nyang, there are three types of Muslims, grasshoppers who wish to be fully assimilated into the dominant host culture and often change their names or are not outwardly recognizable as Muslim, oyster Muslims who are isolationist who tend to cling to more orthodox understandings of religion. These Muslims are somewhat like the Amish or orthodox Jews in being apart from society even while being in it to the limited extent necessary. The third group of Muslims are the owls, which seek a path to reconcile between the grasshoppers and the oysters. 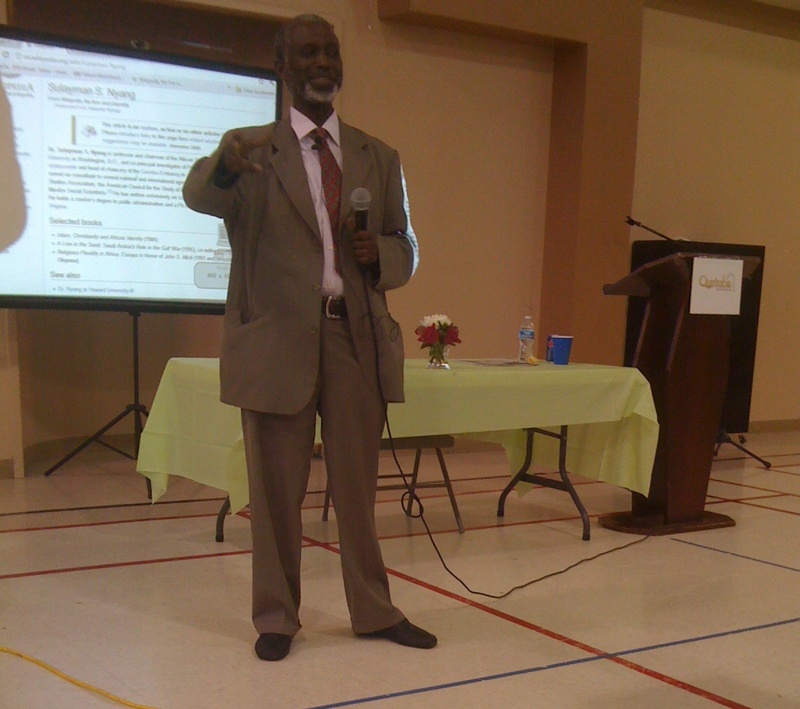 Throughout his talk, Dr. Nyang encouraged the audience to take a proactive role in learning and researching this history to share with others. He also encouraged us as American Muslims today to effect positive change and participate in society through building institutions and also by writing in our campus newspapers to leave traces of a Muslim footprint so that those who come after us will know that we were once here. It’s a thought-provoking question, at your school or workplace or in your community, if you left today, would anyone know a Muslim had been there?